mark tozer's blog: Top Tips - Fog Happens! A true story! It had been a sunny day and they ate lunch lounging on the springy grass and enjoying the scent of wild flowers in the sun beneath a whitewashed stone wall by a lighthouse. 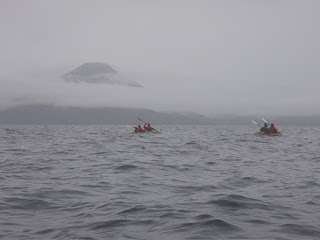 But when they stood to walk back down the island to their kayaks they realized the sea was gone, covered in a dense fog. From up on the island they could see the next headland jutting up out of the fog but nobody in the party had a compass. They were stranded until the fog thinned in the evening, or at least that was their excuse! Carry a compass, and at the very least learn how to take a simple bearing and how to follow it. If you know land is "sort of to the east", that could be enough to get you to shore in event of fog. Otherwise, well, you could be late for tea!